<?xml:namespace prefix = "v" ns = "urn:schemas-microsoft-com:vml" /><?xml:namespace prefix = "w" ns = "urn:schemas-microsoft-com:office:word" />The invention is a small, low-cost disposable device that can be used during minimally invasive procedures to detect the occurrence of an enterotomy. Minimally invasive surgery and robotic surgery are becoming the norm and their benefits and risks are becoming more apparent. One of the well-known risks is an unintended bowel perforation (enterotomy) which can occur throughout the process including at initial abdominal access, port placement, tissue dissection and movement etc. Enterotomies can easily go undetected during minimally invasive surgeries because the surgeons are relying on limited fields of view through endoscopes. 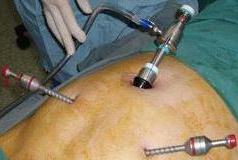 An undetected enterotomy can lead to significant patient morbidity and mortality. Patients with these complications typically require intensive care stays, corrective surgery and sometimes long-term follow-up care leading to increased healthcare costs. Attaches to port outlet so does not need to be located in operating field.